Oh my gosh! Here is a puppet movie, not for kids. Let me repeat a funny, crazy, dirty, rude, and rolling on the floor laughing while covering your face movie…not for kids. I am thrilled to share free admit 2 passes with all of you! 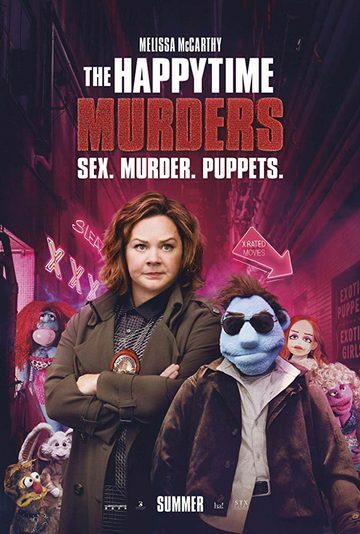 The Happytime Murders stars Melissa McCarthy and a bunch of naughty puppets! After watching the trailer I think this is one of those movies that I want to see and is up there with “Ted”! I love STX movies and I do like Melissa McCarthy so why not?! Watch the trailer before even thinking about possibly taking your kids to the movie. Instead take a BFF and/or a date! enjoy yourself and be ready for some brainless laughter! This movie looks like it was created strictly entertainment! The HAPPYTIME MURDERS movie will probably be funny. I hope I get to go see it.